Fans of Isaac Asimov's original stories and general readers who are aware of the classic status of his I, Robot collection (1950) will know that Mickey Zucker Reichert is following in the steps of some pretty hefty sideburns. Of course, she's not the first to pen a sequel to Asimov's robot stories. Numerous authors—including Greg Bear, Gregory Benford, David Brin, William F. Wu, Robert Oltion, Alexander C. Irvine, Mark W. Tiedemann, and Roger MacBride Allen—have developed Asimov's Robot/Foundation universe over the last two decades, with varying degrees of success. The selling point of this first volume in a new trilogy is that it takes us back to the early days of Susan Calvin, who in Asimov's original stories is a renowned "robopsychologist." Early promotion for the book promised that it would deliver "a blend of sci-fi and medical thriller like Michael Crichton's Andromeda Strain ,” with Calvin "in a high-stakes, suspenseful chase to save society as we know it." On a basic level, it accomplishes this, and readers intrigued by that description will enjoy it. Going beyond this simple assessment of this estate-authorized sequel, though, there are a few additional points that merit discussion. First, and admittedly minor, is the timeline issue. Careful readers of Asimov's works may want to know this, though readers jumping into this book without prior knowledge may not care. Anyone who revisits the original Susan Calvin stories to get a sense of Asimov's chronology regarding US Robots and Mechanical Men will note that Asimov places Calvin's birth in 1982. (This is confirmed by the timeline published in the appendix of David Brin's Foundation's Triumph (1999).) The first chapter of Reichert's novel is dated July 2, 2035. Going by Asimov's timeline, that would make Calvin 53 years old in Reichert's novel. But wait a minute—weren’t we going to meet Calvin in her "early days"? Indeed we do, for as the novel opens Calvin is young and perky. So Reichert's timeline isn’t consistent with the original. Very well; with that pedantic nit out of the way, let's talk about the novel itself. A quick synopsis is in order. At I, Robot: To Protect 's start Calvin is a psychiatric resident at Manhattan Hasbro Hospital (yes, Hasbro as in the toys). She makes friends, finds a love interest, proves her intelligence and courage, cures what seem to be incurable cases, has a costly lapse in judgment, and becomes embroiled in a far-reaching anti-Robot conspiracy at the hands of the evil Society for Humanity. A possible drawback to the novel is that it's rather slow at first. One could argue that the story is enjoyably old-fashioned in the way it takes time at the outset to establish its characters, so that it can shove them into more difficult, frantic situations later on and have us care about their fates. For all intents and purposes, the plot is suspenseful, and quite gripping after the first quarter or so. Also, it's not a bad thing that Reichert invests time in building up her characters. In fact, there's probably more character development in this novel (even some flirting and bona fide romance!) than in the sum of all Asimov's Robot novels. But against the claim that Reichert's time is well-invested in character development, one might make the counter-claim that the characters are not as interesting as they might have been. Calvin herself, for instance, is problematic, and not immediately identifiable as Asimov's. Harlan Ellison, in his unfilmed screenplay adaptation of I, Robot , captured Asimov's portrayal perfectly when he wrote of Calvin that she was "not one of those women who in later years it can be said of them, 'She must have been a beauty when she was younger.'" But by the fourth page of I, Robot: To Protect another character calls Calvin a "pretty woman." Perhaps this can be reconciled by recalling that beauty lies in the eye of the beholder, but Asimov quite famously made Calvin cold, distant, almost misanthropic in his stories. Notice that he never used her as a point of view character in a novel—it was always at shorter lengths. Reichert has some leeway, of course, since she is depicting a much younger Calvin than the one Asimov described, someone who might, over time, become cold and distant. Instead, I think Reichert ends up portraying Calvin as someone who not only possesses superhuman intelligence but is also keenly self-aware, emotionally mature, rational, universally liked by almost all who encounter her, and capable of enormous empathy. All good things, yes; but when combined in this way they make her somewhat difficult to relate to. True to the Asimovian tradition of introducing a new robot in each story whose name is inspired by a model number (Tony after TN-3 in "Satisfaction Guaranteed," Lenny after LNE in "Lenny," Easy after EZ-27 in "Galley Slave," Nestor after NS-2 in "Little Lost Robot," and so on), Reichert presents us with Nate, or N8-C. Compared to some of those older creations, he's fantastically advanced; in fact, humans can't tell he’s not one of us. I found that his sense of humor and camaraderie with the other characters strained believability. Then there's Susan's dad, John Calvin, purportedly a legend at US Robots and Mechanical Men (though he's someone we’ve never heard of before). His character fulfills the demands of Reichert's storyline, but he proves to be a cipher. This may be intentional, depending on what happens in the next two volumes, but it's not entirely satisfying here. Calvin's own love interest feels like a stock character, passable but disposable ("A shower had softened and tamed his sandy hair so it hung down in loose ringlets. Despite his lean frame, she could not help noticing the masculine bulges of his arm muscles and chest" (p. 99)). On the other hand, Calvin's patients are well-crafted, engrossing creations. I won't reveal too much about their conditions, because they represent some of the novel's most interesting thematic material, but four-year-old serial killer sociopath Sharika is unquestionably memorable. While there's nothing particularly wrong with this—it's serviceable, to be sure—it's not what anyone might call exciting or fresh. When Reichert writes things like "Susan could feel her heart hammering in her chest" to convey Calvin's response to a tense situation, I wouldn't blame readers who find themselves underwhelmed by the lack of expressive originality. And yet Asimov himself went to great lengths to develop an unadorned, transparent style. How is this any different, you might ask? The answer is that Reichert's prose isn't as compulsively readable as Asimov's. It's flatter. Then too, Asimov had certain stylistic tics that over time one might come to think of as adorable quirks. (On re-reading his stories, I admit, those tics weren't nearly so adorable.) Reichert's prose is generally lacking in any quirks that might lend it some flavor. But then again, many readers won't care about the prose one way or another, simply because it's not a concern to them, or because they’ll be too wrapped up in the story to notice it. And it's in thinking about the overall story and the narrative's preoccupations that one arrives at another consideration worth airing: this book feels more like a medical thriller than an Asimovian Robot mystery. The medical emphasis appeals to me, since it makes the novel at least moderately innovative. After all, we've had literally dozens of other sequels that focused on the development of Robot rules of behavior and Asimovian societies. We certainly didn't need another retread. 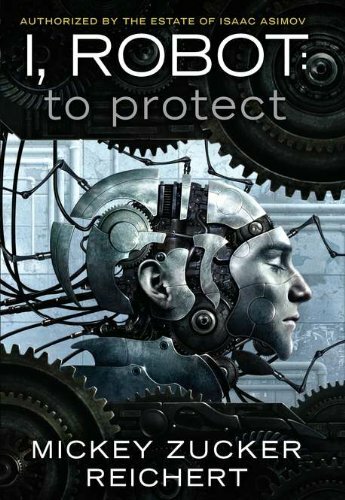 It's clear that the intended readership of I, Robot: To Protect is wider than Asimov fans (and who can blame anyone involved in the project for that? ), and that's not a condemnation. Whereas much Asimovian novel-length fiction consists largely of characters sitting around discussing various ideas and possible courses of action, Reichert's story contains its fair share of action, and at least one honest-to-goodness old-fashioned explosion. Depending on your sensibilities that may sound enticing, or like a put-down. Probably the aspect of the story that I enjoyed most was the carefully worked out details of the patients' situations, and the various clever solutions Calvin devised to their "problems." This qualifies as detective work of a sort, so I suppose mystery elements are present, at least in part. Reichert also concocts an intriguing project involving nanotechnology and the Three Laws of Robotics, one that will hopefully be more fleshed out (positroned out?) in the ensuing volumes. Not only can a case be made that Reichert's angle is a fresh one, but considering the wealth of information provided, she makes her info-dumps surprisingly palatable. I'm not aware of too many SF novels that marry psychodrama (human or robotic) with a biotech mystery. Reichert's novel, despite its lack of technical and aesthetic ambition, does. Whether that's enough to earn your reading vote or not will depend entirely on your tastes. Alvaro Zinos-Amaro grew up in Europe, mostly, and despite the advice of his betters earned a BS in Theoretical Physics and studied creative writing. He now lives in California. His fiction has appeared in Farrago's Wainscot , Neon Literary Magazine , and other online venues. His reviews and critical essays have appeared in The New York Review of Science Fiction , The Internet Review of Science Fiction , Strange Horizons , Foundation , and elsewhere. If you too are waiting for your own pet Aineko, visit Alvaro's blog.